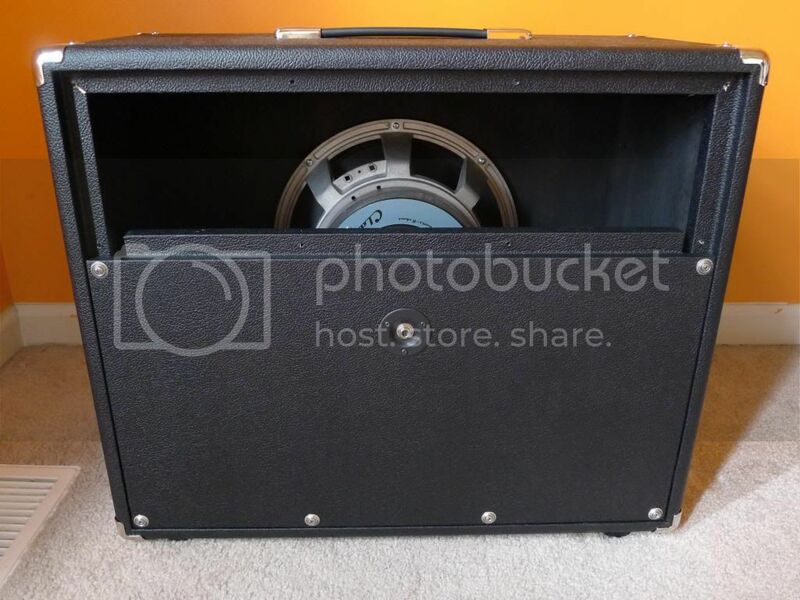 Electro Voice EVM12L in what type of Cabinet? Discussion in 'Amps and Cabs' started by Bruce85, Apr 13, 2016. For those of you who have or have tried this speaker would you say it sounds better in a closed or open back cabinet? I know personal preference plays a part however I am wanting to buy one and a 1x12 to place it in and wanting to know which way I should go. Also any opinions on the standard version vs the Zakk Wylde Black Label? Worth the extra money and what are the main differences in their sound? Look for a Thiele ported 1X12. Actually, I would put an EV in a 2X12 teamed up with a complementary driver like the Fane F-90. guitar29 and WhoJamFan like this. I had mine built by Stagecraft, and it's convertible. I prefer it open with my Boogie. I have a solid wood (cherry) oval back cab. Empty it weighs 25 pounds. EVM12L adds 18 pounds, either of my Fanes 9 pounds. 24x15.5x12 oval open back for me. The rivera tac 112 cab is a great one as well for a little more low end. The normal 200w and the black label 300w sound the same with the power handling being the only difference. I'd say it is better matched with closed. It also works well with open backs so… let your open/closed preference be the judge. Maybe you want to state the style/sound you seek? That said, my personal preference is open back cabs and mine has spent more time in open backs. I'm probably off, but I think the primary difference with the BLS is a larger heat sink -- which allows it a higher power handling. EV recommends an open or ported cab for proper ventilation. These speakers like to move some air with their deep cone. My music is alternative/hard rock. Would it not lose alot of its low end with a ported or open back cab? What makes you prefer it open? Do you notice any lose of low end? I just got a Vboutique Cube and I have one of his Vumble cabs on the way to me now. Those are my favorite speakers, and those Vboutique cabs have to be the best deal going. The owner/builder makes cabs for many of the big boys. My EVM12L is currently happily residing along side a Fane Medusa 150-C in my Port City/Reeves OS 2X12. It can keep up with most any 4X12. I can hear myself better with the back open. I'm sure there's less bass present, but I don't really notice it when I'm playing with a band. So what are the downfalls if this speaker was used in a closed back? Heat without those big cooling fins. It would depend on the cabinet size. The low end is virtually nonexistent in an open back. I currently have one in a Rivera open back combo and it sounds anemic. A Thiele is best for these speakers, although Zakk uses them in 4x12's. These speakers like volume. Not designed for bedroom amps so don't expect much there. If you want an open back I'd look into a different speaker. If you ask me, open is neutral. Closed back designs vary greatly. Specifically, there is reflection, directionality, and greater resonance of a closed back cab. Generally, the larger the cab, the lower the resonance. That is, the cab emphasizes and reinforces low end. So the question when choosing a closed back cab is finding one which compliments your sound/amp/guitar. I agree with FFTT here; a Thiele is a good match. There are plenty of people using open backs in alt and hard rock. Not so much in metal. Open backs may be too loose for that. I definitely don't want the loss of low end. Mmm. I wanted to have a 1x12 built for me but im not sure if the guy does them with ports. Well, open backs are not typically 100% open. So a Half-Open back will reflect less than a 25% Open Back. With proper design, a ported cab acts like a bass reflex cab reinforcing the low end fullness. Baxtercat and Bruce85 like this.